I've admitted before that I'm obsessed about bags, and that I'm a total perfectionist about trying to find the One Bag. That Maxpedition bag was good, but it inevitably ended up not being perfect. One of the reasons was that I started walking to work fairly frequently, and so I needed more space to put my packed lunch and a change of t-shirt (without having to carry another bag). I tried using my old Crumpler messenger bag, but that made my back and shoulder hurt when walking with it for long distances, and it was only just big enough for the extra stuff, despite looking like a huge bag. So I swapped to using an old, cheap day rucksack, which was certainly large enough, but the pockets were badly organised so that I was constantly fishing for what I needed, and wasn't waterproof, so I had to mess about with plastic bags. What's more, it felt like an enormous, ungainly bag when I was only carrying a few things, so I was constantly packing and unpacking stuff into smaller bags as necessary. 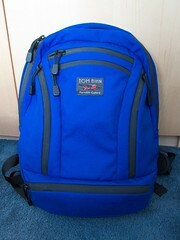 Since I was about to have a significant birthday, and I have been trying to invest in fewer, better made, longer lasting things, I decided that I would finally spring for a Tom Bihn bag as a kind of 40th birthday present to myself1. I had been eyeing the Synapse rucksack for a while, and it seemed like the perfect size and configuration for my needs, as well as being small enough to fit a shorty like me. I couldn't resist the Indigo/Solar colour combination (vivid blue outside and bright yellow inside), as it is almost exactly the same colour combination as the wonderful hyacinth macaws I've seen in Brazil. The shipping cost has also been reduced a bit recently, so it made it more affordable, and I took the plunge, ordering a Side Effect and a few organiser pouches and a sleeve for my netbook at the same time. Unfortunately, the colour combination was on back order, so I had to wait (impatiently) until they came back into stock again. At last, it shipped, and by a very happy coincidence, the delivery date turned out to be my birthday. When I finally got my hands on the package (several days after my birthday — see below for that sad tale), I was really impressed with the quality of all the products, and the colour of the bag was every bit as beautiful as I had hoped. The yellow lining is actually very practical, as you can see what's in the pockets much easier. Reading comments from other Synapse owners on the forum, I know I was not alone in worrying whether it was going to be big enough for all my stuff when getting it out of the box. It looks like a small bag, but in fact, it's a TARDIS in disguise. I excitedly (I know, I'm sad) emptied out my old bag, and started packing the new one. When I had moved everything over, I thought, "Wait, that can't be right". The Synapse still had masses of empty space in it, looked as neat and compact as when it was empty, and when I put it on my back, it seemed to weigh roughly half what my old bag did with the same contents. I really don't know how they do it, but it is an incredibly deceptive bag. It looks the same when empty or stuffed to the gills, and it looks like a small bag. However, I found that I could easily fit in my netbook in a padded sleeve, a spare top and my lunch, or even my Macbook instead of the netbook with a bit more of a squeeze. It's really comfortable to carry, whether I'm walking or cycling, and it has proved to be waterproof in a few heavy showers. It even seems to manage to mitigate the usual problem of rucksacks which is that it's harder to get things out of the pockets on the move than with a shoulder or messenger bag. The side pockets (where I keep my keys and wallet) are situated such that it's actually quite easy to slip the strap off one shoulder, open the pocket, fish out what you need, and zip it back up again without having to put the bag down. I put the Side Effect in the bottom pocket, and use it as another container to organise bits and bobs, but I can also transfer a few things and use that as a standalone bag if a rucksack would be over the top. Having said that, the Synapse is so compact and well-structured that it never feels over the top, even if you're carrying only a few things. I think that the Side Effect will be really useful when flying, as you can tuck it inside the Synapse while checking in (and thus get around the strict 'one carry-on item only' rule), but then bring it out on the plane to carry things you want easy access to like your passport, music player, wallet, earplugs etc., and it will tuck in the seat-back pocket. I'm really happy with the bag, and feel that it's such a perfect fit for what I need that I'm likely to be carrying it for many years to come. Tom Bihn is — I think he would probably admit — also an obsessive about bags, and it's the attention to the small details, quality of materials and clever structure of the bag that really makes it special. My only regret is that I didn't order more organiser pouches when I had the chance (it wouldn't be worth the shipping to just get those now). I hadn't appreciated quite how useful they would be for collecting together things conveniently. They also allow you to have a semi-modular bag, grouping together things that — say — you need for work, but you can take out when going walking for a day. I would probably get another clear mini pouch and two small cordura pouches. Oh well, I can see that I'm unlikely to be able to kick the Tom Bihn habit, so I'm sure there will be a next time. Tom Bihn sends their International packages with UPS, as it seems that they get a good price and full tracking. Certainly, my package shipped quickly, and was out for delivery on the day predicted: my birthday. I was working at home that day anyway, preparing for a conference I was organising, so I was pleased that I would get an extra birthday treat, and also be able to travel to the conference with my new bag the next day. I waited in all day, careful to listen out for the door bell. Since it was an international package, I knew that I would have to pay duty on delivery, so I couldn't get a neighbour to accept the package for me. When I checked the tracking again at 4.30pm, I found to my total bafflement and irritation that it said that that driver had called just a few minutes earlier, and there was no-one to receive the package. This, obviously, was complete rubbish. I was practically looking out the window at the driveway at the time listed, and no-one had come to the door, nor was there a card through the door, so I strongly suspected that the driver just couldn't be bothered. I immediately called UPS and finally got through to someone. They said they'd call the local depot and get them to ring me back within the hour. Eventually, they did call me back, over an hour later, saying that it was now too late and it would have to go out again the next day. I explained that I wasn't satisfied with this, since I had waited in all day, I was leaving the next day for a trip, and my husband wasn't likely to be able to be at home the next day, and asked for them to deliver before 9.30am. They promised to do their best and were all apologies but I wasn't convinced that it was going to work. Sure enough, no-one had come by 9.30, and I had to leave. Mr. B. was sweet enough to rearrange his day to stay in and wait, and told me that the package eventually showed up at 1.30pm, marked prominently with the words, "Important: Delivery by 9:30am". On top of that, the delivery guy would only take cash or cheque for the duty payment, not a card, so he had to dig around for our chequebook. None of that is Tom Bihn's fault of course. We may have a particularly useless local depot, but it's not the first time I've had problems with UPS. In contrast, a few weeks later, my Squeezebox was delivered by DPD, and the experience was totally different. The delivery was next working day, and the tracking system gave an estimated 1 hour long delivery time window. Sure enough, the parcel turned up one minute after the start of this time window. With accurate GPS tracking like this, I don't know why other companies can't offer more precise estimates of delivery time. Of course, this was only being transported within the UK, but my problems with UPS only started when it was being delivered from the local hub.